He fought through the lines of the Mexican siege, and on 1 March 1836 returned to the Alamo with 32 volunteers from Gonzales’ and De Witt’s Companies. He perished in defense of the Alamo on 6 March 1836. Although Martin’s body was likely burned with the other defenders of the Alamo, a monument exists in Providence’s North Burial Ground commemorating his role in the defense, and is Rhode Island’s only memorial to the Alamo. In 2012, he was inducted into the Rhode Island Hall of Fame. Martin’s heirs received 640 acres of land in San Jacinto County as a result of his service from 26 September 1835 to 6 March 1836. Mills DeForest Andross was said to have been born in Bradford, Orange County, Vermont in 1809 to Captain John Andross (the son of Dr. Bildad Andross) and his wife, Rebecca (daughter of Col. John Barron). Mills married Eliza Peabody and went to New Orleans before removing to Texas. 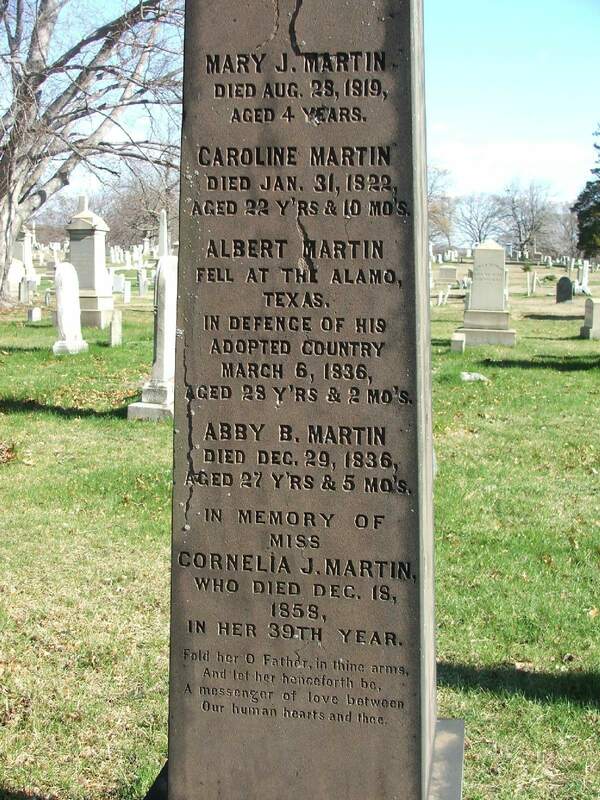 In 1836, he was recorded as a resident of San Patricio, Texas, and he served as a rifleman in Captain Blazeby’s Infantry Company. He also served in Lieut. Colonel James Clinton Neill’s command. Little is known about Andross’ life in Vermont or in Texas. It is said that he was taken prisoner with 29 other men at the Alamo, where he was massacred. It is known that he was killed in the siege of the Alamo on 6 March 1836. John Flanders, who was born c. 1799, likely in Salisbury, Massachusetts, came to Texas by way of New Orleans and was a resident of Gonzalez, Texas, in 1836. John Flanders was the son of Levi Flanders, a Revolutionary War patriot. John Flanders left his home after a disagreement with his father over a business transaction and traveled to New Orleans. He was one of the 32 men who volunteered at the behest of Captain Albert Martin on 1 March 1836. Flanders served as a private and was among those who died in the siege on 6 March 1836. Despite never having been married or had children, the heirs of John Flanders were granted 1,920 acres of land in Dimmit County, Texas, which they received on 17 October 1851. William D. Howell was born in Massachusetts in 1797, but spent much of his life serving as a doctor in New York before relocating to Texas through New Orleans in 1835. Howell was a surgeon who participated in the siege of Bexar and then served in Captain William Blazeby’s Infantry Company at the defense of the Alamo. He died during the defense on 6 March 1836. William D. Howell was also a member of Thomas H. Breece’s New Orleans Greys. His heirs received 1,920 acres of land in Runnels County on 18 February 1875. Dr. Amos Pollard, the chief surgeon at the defense of the Alamo, was born on 29 October 1803 in Surry, Cheshire County, New Hampshire, to Jonas and Martha Pollard. Amos Pollard married Fannie Parker in Landgrove, Vermont, and they had one daughter prior to his wife’s death in 1831. At the time of his marriage, Pollard was working in New York City, but he relocated to Texas in 1834. In a letter to the editor of the Liberator, a newspaper in Boston in 1836, Pollard notes that he practiced as a doctor in both Boston and New York and that he was a native of Massachusetts. Pollard participated in the fight for Gonzalez, the opening battle of the Texas Revolution on 2 October 1835, and on 23 October, Stephen F. Austin appointed Pollard the chief surgeon of his garrison. During the defense of the Alamo, Pollard set up a hospital within the building; he died 6 March 1836, likely defending the Alamo hospital. Amos Pollard is one of the few Alamo defenders to have a portrait created during his lifetime and this portrait now hangs at the Alamo. Other New Englanders who served at the Alamo include William Linn, Robert E. Cochran of New Hampshire, and Gordon C. Jennings of Connecticut. Patrick T. Conley, The Makers of Modern Rhode Island (Charleston, S.C., 2012). Texas Republican (Brazoria, Texas), 10 October 1835, p. 2. John Henry Brown, History of Texas; from 1685 to 1892, 2 vols. (St. Louis, Mo., 1892–93), 1: 565. Conley, The Makers of Modern Rhode Island. 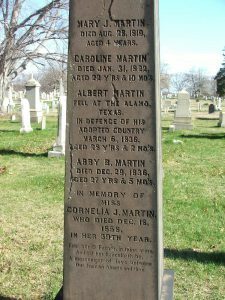 Rhode Island Historical Cemetery Commission, Gravestone of Albert Martin, North Burial Ground, Providence, Rhode Island. Rhode Island Heritage Hall of Fame entry for Captain Albert Martin, http://www.riheritagehalloffame.org/inductees_detail.cfm?crit=det&iid=679. Thomas Lloyd Miller, Bounty and Donation Land Grants of Texas, 1835-1888 (Austin, Texas, 1967), p. 437. Rev. Silas McKeen, A History of Bradford, Vermont (Montpelier, Vt., 1875), pp. 177-78. Texas State Historical Association, Entry for Mills DeForest Andross, https://tshaonline.org/handbook/online/articles/fan46. McKeen, A History of Bradford, Vermont, pp. 177-78. Mary Deborah Petite, 1836 Facts about the Alamo and the Texas War for Independence (1999), p. 62. Daughters of the American Revolution, The Alamo Heroes and Their Revolutionary Ancestors (San Antonio, Texas, 1976), p. 23. Texas State Historical Association, Entry for John Flanders, https://tshaonline.org/handbook/online/articles/ffl38. Leonora Bennett, Historical Sketch and Guide to the Alamo (San Antonio, Texas, 1904), p. 130. Miller, Bounty and Donation Land Grants of Texas, 1835-1888, p. 266. Texas State Historical Association, Entry for William D. Howell, https://www.tshaonline.org/handbook/online/articles/fhobf. Thomas Ricks Lindley, Alamo Traces: New Evidence and New Conclusions (Lanham, Md., 2003), p. 143. Miller, Bounty and Donation Land Grants of Texas, 1835-1888. Surry History Committee, Surry (Charleston, S.C., 2003), p. 26. Texas State Historical Association, Entry for Dr. Amos Pollard, https://tshaonline.org/handbook/online/articles/fpo08. Letter from Columbia, Texas, in Liberator, 16 May 1835, vol. 5, Issue 20, p. 77. Zachary, Thanks for your interesting article. Would you know whether there was a particular migration pattern to gulf areas such as New Orleans and Texas in the 1830s, possibly as the result of advertising in newspapers? Is there something about that time period? Just wondering whether these issues came up in your searches…. Many thanks. Zachary, I’ve been researching Dr. Amos Pollard for some time, as he was a distant cousin of mine. I would like to discuss some of the details of your profile of him, and would appreciate it if you could contact me by email. Thanks so much. I have been recently surveying property in Surry, NH near Dr. Pollard’s boyhood home. Have you come across any information that he may have apprenticed under any local Doctors prior to studying medicine at Vermont Academy Medical School in Castleton, VT, class of 1825? The simple answer is no, I have not, but then it’s not something I’ve looked for. Your question does suggest another avenue of possible research. Thank you. As a boy he grew up next to an abandoned pre-Revolutionary War Spanish gold mine, and then became a Surgeon. There appears to be a good chance that he may have spent some time in his youth in the mine wielding a hammer and chisel to test his luck, followed by a possible apprenticeship with a local doctor where he may have had the opportunity to wield a surgical bone chisel and hammer, or at least learn how to use them properly. There is an ornately carved boulder (a 4 foot long musket with bayonet and an 18 inch tomahawk carved into the top) that sits on a hillside about midway between what was his boyhood home and the home/office of the Surry Town Doctor (Dr. Phillip Monroe). Have you come across any artistic indications for him, that may suggest he would have been the artist? The year 1819, when he was 15 years old, was the 50th anniversary of the Surry Town Charter (his father was a Selectman from 1814 to 1822, excepting 1819-20), and if the hillside was an open field by then, the stone was clearly overlooking Surry Village and the whole Ashuelot River Valley in Surry and Keene. Both Surry and Keene were under assault during the earlier French and Indian Wars. A compulsion to spend the time creating such a memorial in his youth could help explain the abandonment of his Manhattan medical practice for the rough frontier in Texas. I see on a map in an old History of Surry from 1925 that the old mine was right next to his father’s house; not hard to imagine that youthful curiosity would have led him to explore there. I haven’t been able to find any information about the “musket boulder;” just one with a bow and arrow carved on it, which may date to roughly the Civil War period. Apparently, Dr. Munroe’s son Nahum studied medicine at Castleton as Amos did; suggests a likely connection between the families. As for going to New Orleans/Texas, who knows? The Alamo has such an aura of righteous mystique about it that we’ve forgotten that the story is much more complex- on both the Mexican and the Texian sides- than the story we keep repeating and expanding. My childhood was spent hearing “Remember the Alamo” and hearing stories about the rest of it. I wonder if it is not time for America to become more honest with itself about this part of American history, as we have begun to be about other parts of our history, albeit reluctantly?